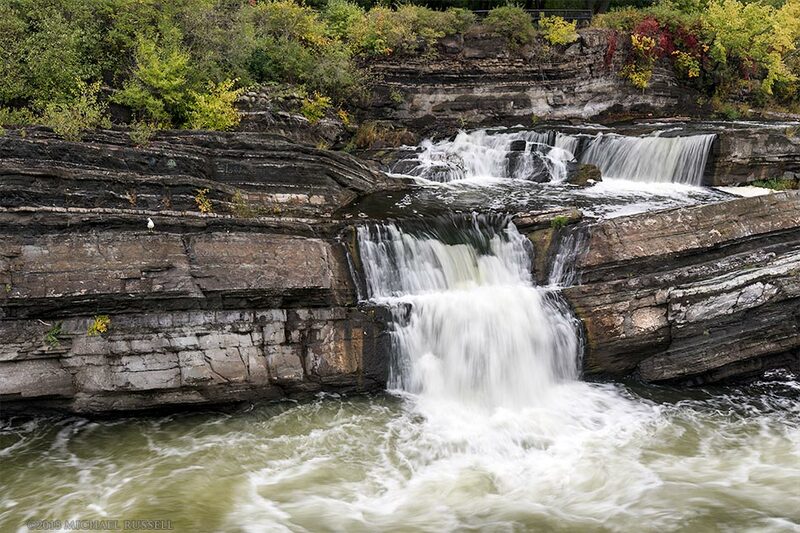 Hog’s Back Falls, the Rideau River and the Hog’s Back Bridge in Ottawa, Ontario, Canada. Photographed from Hog’s Back Park. 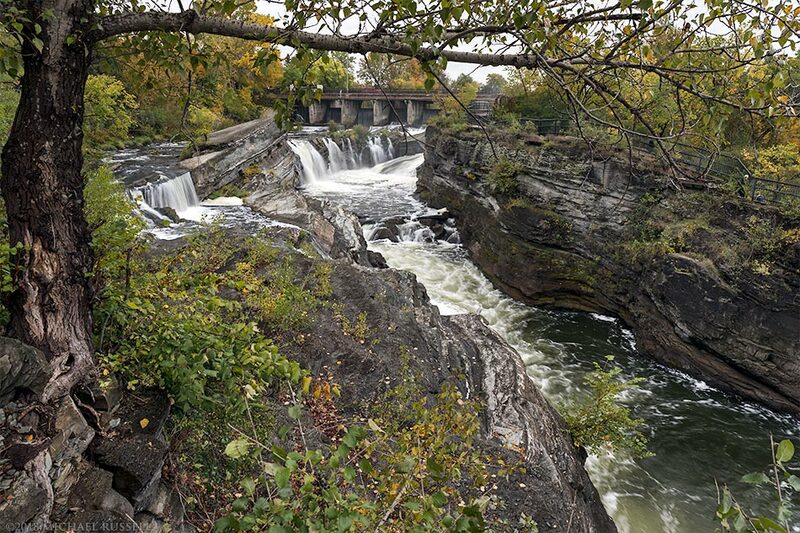 During my trip to Ontario and Québec I visited a waterfall in Ottawa, along the Rideau River, called Hogs Back Falls (or Prince of Wales Falls, officially). 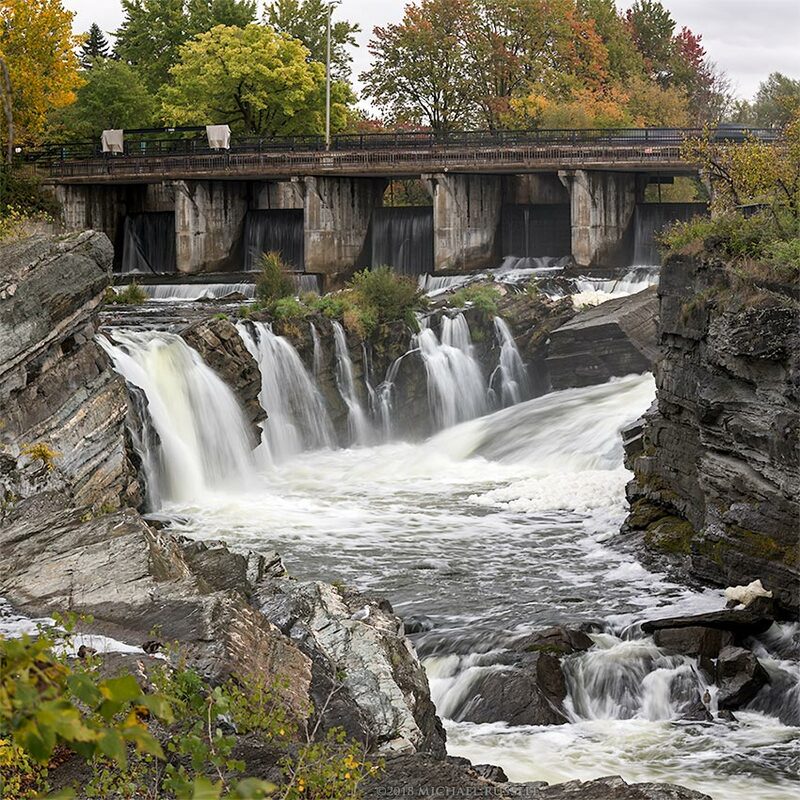 Hogs Back Falls are not actually a natural waterfall, and are the result of construction of a waste water channel during the building of the Rideau Canal. Originally this section of the river was a 2000 meter long rapids, some of which is still visible below Hogs Back Falls. The first two photographs here are from the first viewpoint we found in Hogs Back Park. It has a nice view up the Rideau River and looks directly towards Hogs Back Falls. I made this initial composition to try to portray what a visitor would see here. I often start with a “big picture” photograph of an area and then try to work on more detailed compositions of individual elements that make a scene interesting. At this viewpoint we noticed a Great Blue Heron (Ardea herodias) hunting for prey next to a small waterfall below. Another photographer at that spot offered me the use of his 100-400 lens. I declined, but he insisted, so I put the lens on and made a few photographs which did not turn out. This lens was interesting to try, but I also knew this was the wrong angle to photograph the Heron and I could probably do pretty well at a better spot. The 100-400 is a nice lens, and there are times when I’d want to use one, but not enough to buy one. Rather expensive for the amount of use I would get out of it and also quite heavy and large for my already near capacity camera bag (and back). If I was a serious wildlife photographer I’d likely own one already, but until that happens I’ll stick with my 70-200 and the 1.4x extender that I usually have attached (since I moved to a full frame camera). After I changed locations to a spot closer to the bridge, I was able to view and photograph the heron much easier than at the first viewpoint. The photograph above is the result. A number of people have picked it as their favourite out of my “top 10” favourite images from 2018 post. I like Herons. Not only do they “pose” nicely and sit still quite often which makes a photograph easier, they seem to have an air of elegance or something about them. Except when they don’t. Years ago I photographed one strutting around near the Capilano Fish Hatchery in North Vancouver (Great Blue Heron at Capilano River). I still quite like that photograph, but I most remember that heron as appearing young and inexperience by trying to eat some discarded gills (from the hatchery) that were laying about. It seems gills are quite rough and hard to swallow, as the heron appeared to choke for about 10 minutes before expectorating the gills back up onto the rocks. I chalked this up to an inexperience Heron, but perhaps they just aren’t that bright? 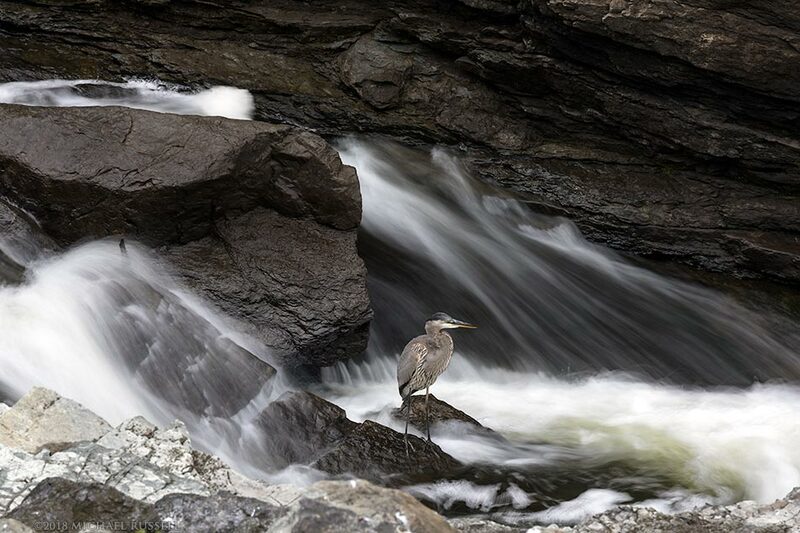 The Heron at Hogs Back Falls also had an embarrassing moment in public. At one point it snagged what looked like a Smallmouth Bass (Micropterus dolomieu) and then tried to swallow it whole, as Herons do. 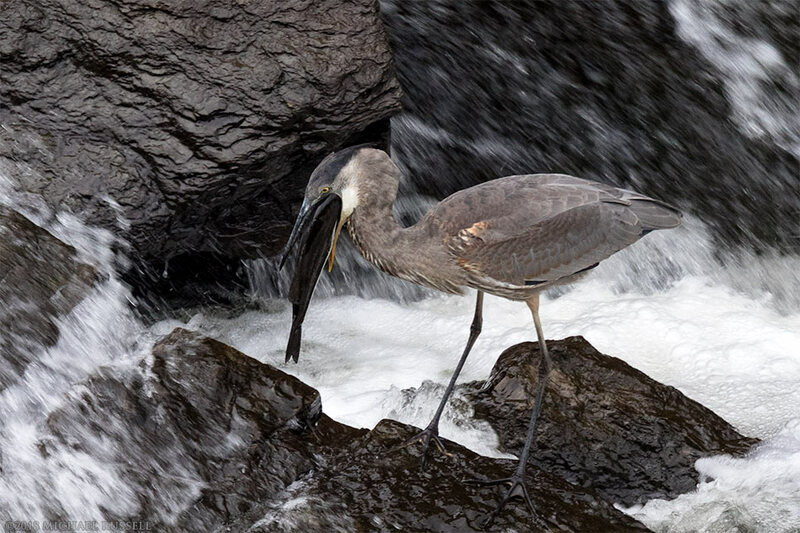 It appears that no matter how willing the Heron, its esophagus was not up to the diameter required for the task, After several inelegant minutes attempting to choke down this Bass, it too was spit back onto the rocks, only to fall into the river. The Heron then returned to fishing for something a bit more manageable. After photographing the Heron we worked our way over the Hogs Back Bridge and photographed the Rideau River and many smaller water falls on the rocks below. For more photographs from the Ottawa area visit my Ontario Gallery. The Skeena Queen docked at the BC Ferry terminal at Fulford Harbour on Salt Spring Island, British Columbia, Canada. 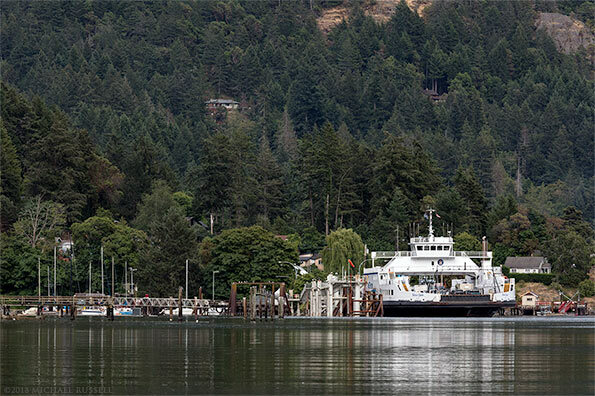 Fulford Harbour on Salt Spring Island is one of the 3 areas on the island with a BC Ferries terminal (in addition to Vesuvius and Long Harbour). I photographed the Skeena Queen dropping off passengers at Fulford Harbour during my last trip there in early June. This BC Ferries route goes between Fulford Harbour and Swartz Bay (near Victoria) on Vancouver Island. I like the Fulford Harbour area – it isn’t as busy as Ganges and offers some nice views of the water from the village itself as well as from Drummond Park. Fulford also offers a cafe and bakery, a restaurant, various artist studios, and a country store. During a previous trip I photographed the historic St. Paul’s Catholic Church (1885) which is near the village. This Mute Swan (Cygnus olor) immediately swam over when it saw me standing near the shoreline. I presume people feed the small population of the non-native Swans here and this one was heading over for a free snack. It wasn’t going to get anything from me, but I did take the opportunity to make a photograph. This was right near the outflow of Fulford Creek into Fulford Harbour which is probably a good place to forage for tasty morsels in a more natural way. 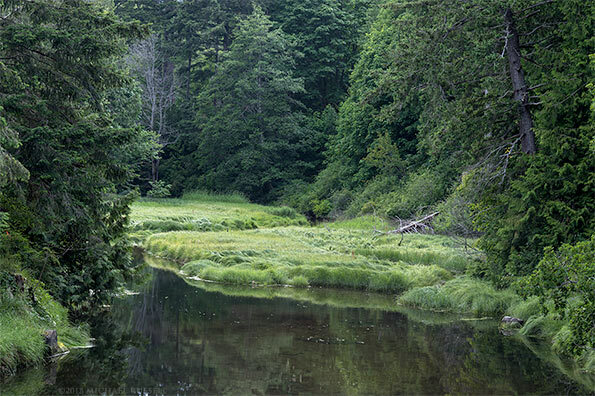 I made this photograph of Fulford Creek near the old site of the Fulford Inn. Fulford Creek is home to one of the the largest salmon runs in the Southern Gulf Islands. Home to Coho (Oncorhynchus kisutch) and Chum (O. keta) Salmon as well as Cutthroat Trout (O. clarkii) the creek fish populations are threatened mostly due to low water flows in the summer. I had just photographed the ferry above and failed to judge when the disembarking traffic was going to be going by, so I was stuck on the wrong side of the road for a while before I could get back to my car! 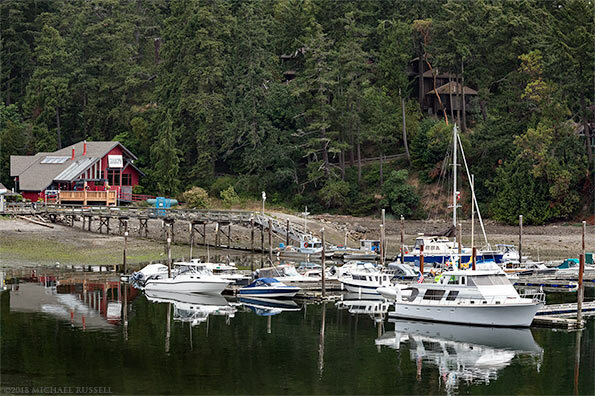 More photographs from my trips to Salt Spring can be found in my Salt Spring Island Gallery. Boats in Ganges Harbour on Salt Spring Island, British Columbia, Canada. Earlier this year I made my second trip to Salt Spring Island – one of British Columbia’s Southern Gulf Islands. During my last trip I also had limited time, so I was able to check out some new areas this time around and more thoroughly explore some others. One area I spent more time in on this trip was Ganges. Ganges is an unincorporated town on Salt Spring Island and has most of the shopping and small businesses on the island. Ganges is also known for the Salt Spring Island Market in the summer. Ganges Harbour has a lot of marinas, boardwalks, and small shops along it’s waterfront. I spent a few hours there making photographs the morning of the second day on this trip. The first photograph here shows some of the small yachts and boats in one marina, with Moby’s Pub and a few waterfront homes in the background. 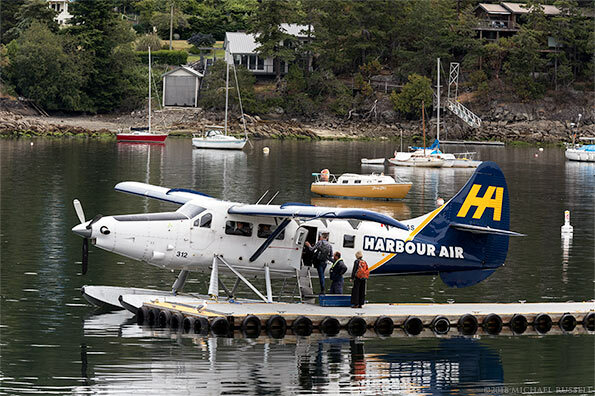 In addition to boats and marinas Ganges Harbour has a small Seaplane Aerodrome used by Harbour Air and Seair Seaplanes. I don’t know where this Harbour Air Single Otter flight was departing to, but it likely was heading to Vancouver or YVR (the Vancouver area’s main airport). 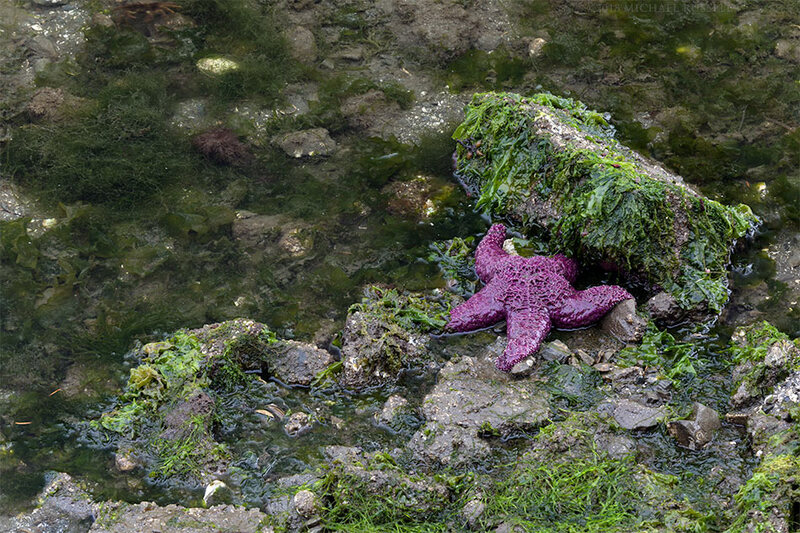 This Purple Sea Star (Pisaster ochraceus) and the Great Blue Heron (Ardea herodias) were both in the intertidal zone below the boardwalk. 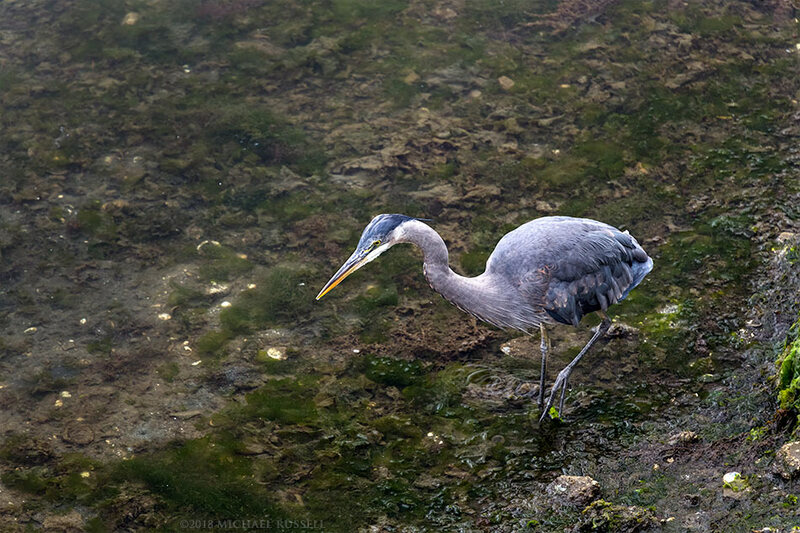 I do enjoy photographing Herons as they tend to move slowly when hunting and make goods subjects. I didn’t have to worry about the Sea Star moving around either! I watched the heron for about 20 minutes, and recorded some video of it hunting as well. Apparently if being filmed, Herons know to grab their snack and immediately run out of the frame to eat it. I saw this Heron catch a number of small fish, but it always walked out of the frame before swallowing them, unfortunately. While photographing the Heron I was switching to different subjects such as various boats and the Sea Plane taxiing for takeoff before switching back to the Heron. 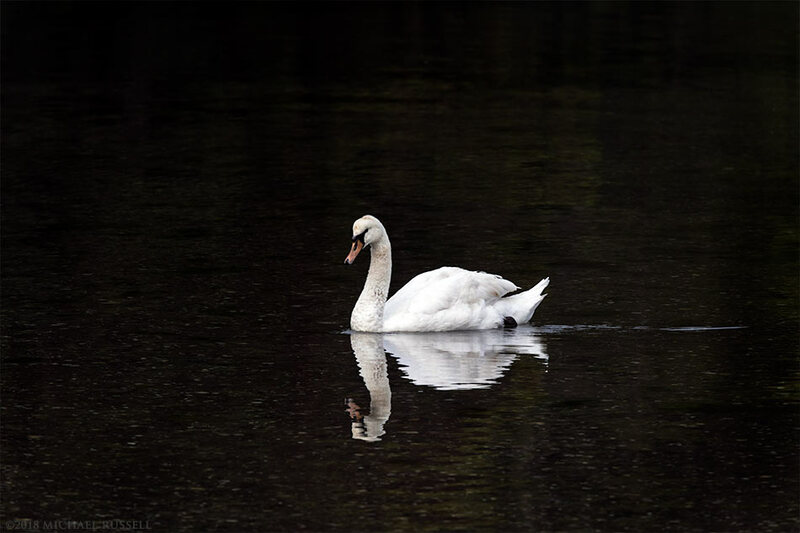 Stay tuned for a number of other blog posts with photographs from Salt Spring but if you can’t wait – you can see all my photographs from the island in my Salt Spring Island Gallery. 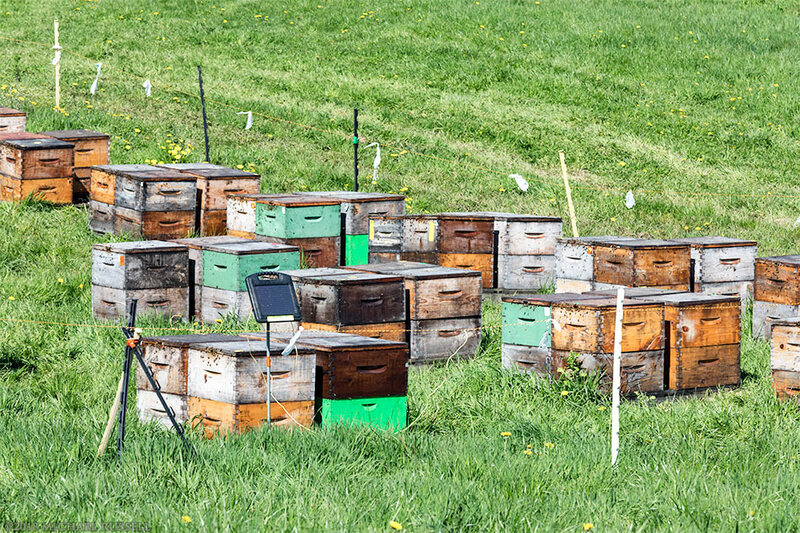 Bee hives in an Abbotsford, British Columbia apiary. I was photographing a scene with farmland and Mount Baker the other day in Abbotsford, BC. This was to be my first stop of many on the way through Mission, the Harrison area and Agassiz. Some horses came over to the fence to say hello, but wandered off after they realized I didn’t have any treats or anything for them. With the horses came the flies, which was annoying. I made this photograph of the bee hives in the field (probably 60 feet away from me) soon after. I made 3 exposures. The first two were like this, and the third is very blurry. As I was making the 3rd exposure a bee flew partly up my nose (I thought it was a fly). After a failed “one nostril push” maneuver to get it out I grabbed it with my fingers. The result of this was a bee stinger lodged in that space between my upper lip and my recently invaded nostril. I had not been stung by a bee since I was a kid, and it is still the unpleasant experience that I recall. It felt a bit like I’d been hit in the teeth with something. I quickly got in my car (I’d been standing next to it) and looked in the rear view mirror. Sure enough, there was a bee stinger in my face. I tried to flick it out with a fingernail but it stayed put. I then remembered reading that you can get them out with a credit card or something flat like that. If you grab a stinger with your fingers, the round part above the surface will act a bit like a turkey baster – and you’ll inject all the venom into the wound. I wished to avoid this, and a quick flick with a credit card got the stinger out of my face. All in all it was probably only in there for 10-15 seconds. Not having had a sting for 25+ years, I wasn’t sure how my body was going to react. Things like this can swell quit a bit, so I cut my trip short (after only about 25 minutes) to go home and endure whatever messy aftermath was to befall me rather than it playing out in public. I didn’t want a golf ball sized swelling on my face when I was trying to photograph either. So I grabbed the freezer pack from my cooler, stuck it on my face, and drove home. As it turned out I only had some minor swelling and it all settled down after about 30 minutes (the ice probably helped). I went out again to shoot a local park after dinner. I guess it was a relatively good outcome that the worst of this was that I had to postpone my trip one day. I’m also glad that I managed to complete shooting Mount Baker and the farmland successfully so I won’t have to return to that spot! For more photographs of bees and other critters take a look at my Animals and Wildlife Gallery. A Barred Owl (Strix varia) looks down from its perch in a backyard forest in the Fraser Valley of British Columbia, Canada. 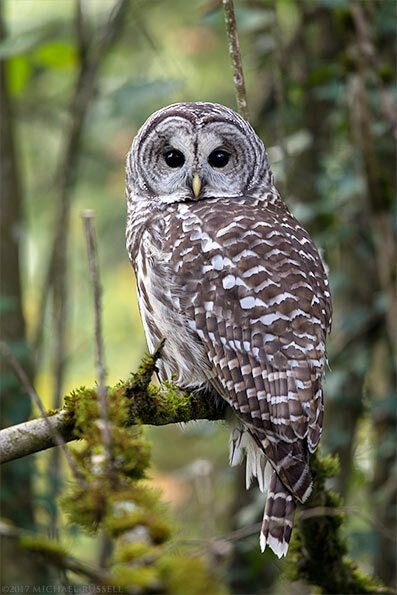 I have described myself before here as a “wildlife opportunist” in that I seldom seek out animals to photograph, but happily do so when they are nearby – as was the case with this Barred Owl a few days ago. 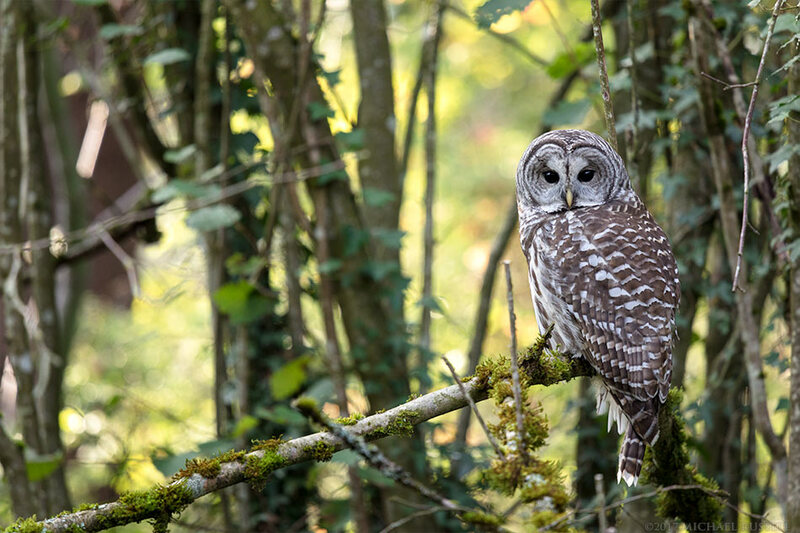 I came home from some grocery shopping and decided to check out why the Northwestern Crows (Corvus caurinus) and Steller’s Jays (Perisoreus canadensis) were going a bit nuts in the forest next to my house, and found they were harassing a Barred Owl. I immediately went inside and grabbed my camera. As with any wildlife encounter, my camera had the widest angle lens on it at the time, so I had to switch to my 70-200, replace the battery, and put in a new memory card. 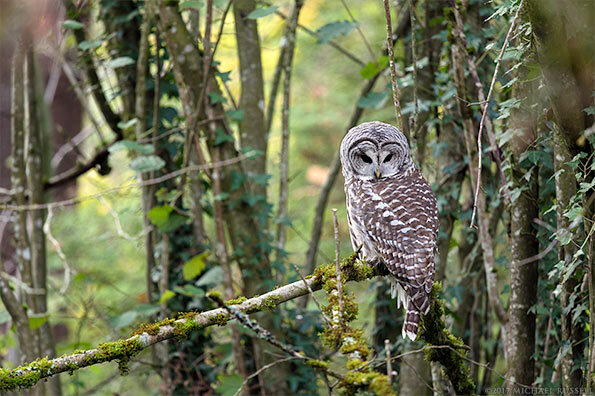 Luckily the Barred Owl was still in the trees when I returned. The crows and jays seemed more worried about my presence than they were motivated to harass the owl, so they moved on pretty quickly. I made a few photographs of the owl but as usual with the owls I see, there were plenty of branches and leaves in the way. 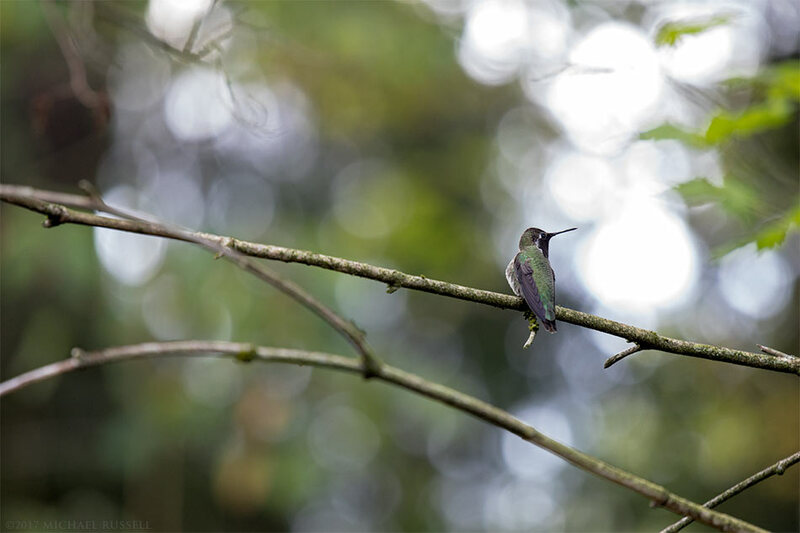 I did what I could, but then another bird species actually helped me out – an Annas Hummingbird (Calypte anna). Hummingbirds can be quite aggressive and territorial, and this one was living up to that reputation. A group of hummingbirds is called a “troubling” which makes sense in this context. Another name – a “charm” of hummingbirds doesn’t seem quite as relevant. This summer I saw a Bald Eagle fly over the house – without the usual assortment of crows etc harassing it. What was after the eagle was a small swarm of Hummingbirds orbiting it like angry wasps. The Hummingbird in this case would strafe the owl, hover, move off, and then repeat. Occasionally it would perch nearby before continuing the harassment campaign. What worked out in my favor was that the Hummingbird actually ran into the back of the owls head at one point, and so the owl moved to a different location about 20 feet away. 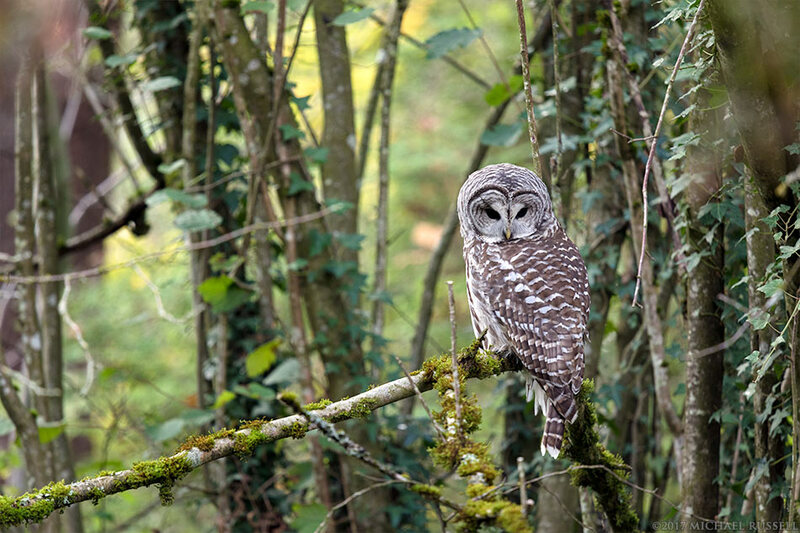 Also lucky for me was that this actually put the Barred Owl in a better position for me to photograph it without (as many) distracting branches and leaves in the frame. When I photograph wildlife I try to make sure I am not disturbing their normal behaviour as much as possible. This owl seemed much more interested in what was happening on the ground below it with the occasional glance at me or to track the latest strafe from the Hummingbird. This was maybe an hour before sunset so perhaps it was starting to think about hunting. I’ve found a few owl pellets on the ground near here this fall, and found a number last winter, so there is a chance I’ll see this individual again. For more photographs of owls and other birds visit my Bird Gallery. 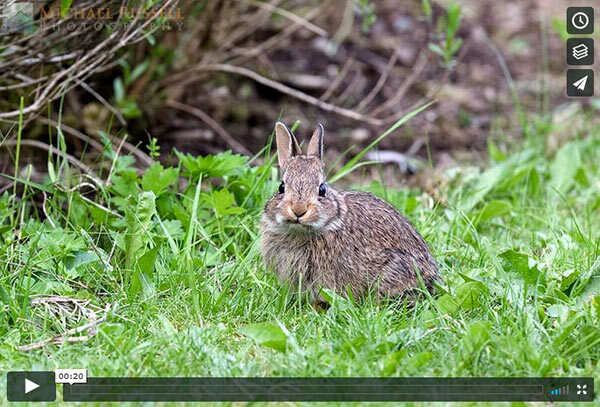 A young Eastern Cottontail (Sylvilagus floridanus) eating the dandelion leaves in a backyard garden in the Fraser Valley of British Columbia, Canada. On occasion I do not have to venture too far for some wildlife photography. 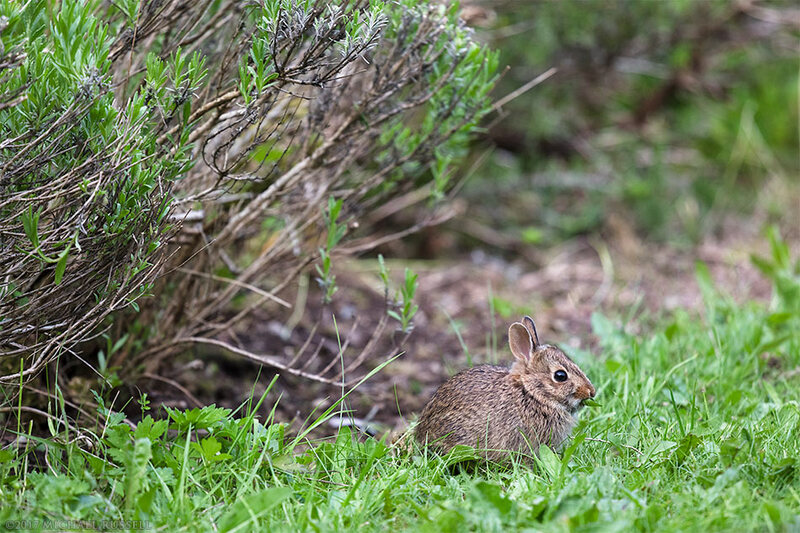 Earlier this year I photographed a young Eastern Cottontail (Sylvilagus floridanus) rabbit munching on dandelion leaves about 20 feet from the house. I’d noticed this small rabbit emerging from the lavender bushes a few times, but I was always across the yard and wasn’t in any position to go get a camera and come back. So on this occasion I saw him active there, and decided to actually treat this like I would other wildlife. I got my camera gear together, walked outside and, sat down, and waited. One of the ways to ensure that you aren’t disturbing wildlife is to have them come to you, or stay put and see how they react. Not only do you avoid freaking them out or disturbing their routine, you get more natural photos at the same time – and often they’ll come closer if they don’t feel threatened. The most agitated this one got were a few apparently dirty looks in my direction. This method is not something to try with potentially dangerous animals though such as bears, moose, cougars, or killer rabbits. After about 5-10 minutes the young rabbit emerged and after looking me over for a while, started eating dandelion leaves in the lawn. 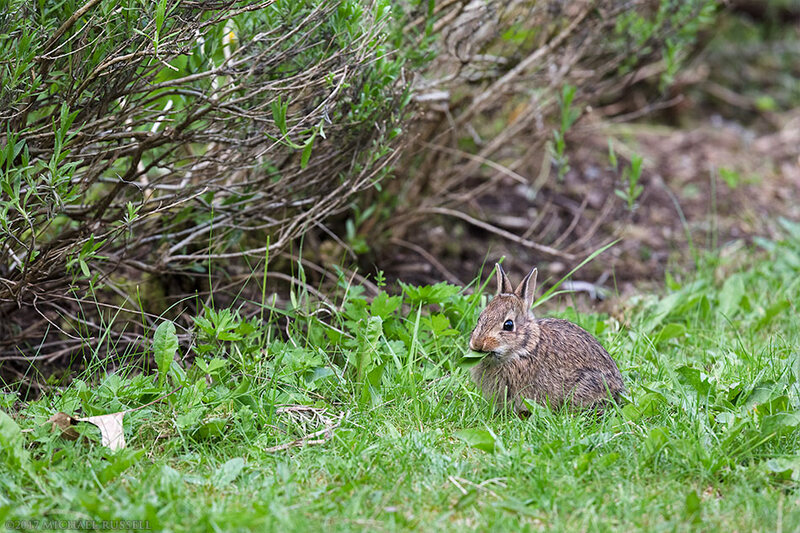 I was surprised how many leaves this rabbit ate – I photographed it for about 15 minutes and it never stopped vacuuming up dandelion leaves the entire time. Young rabbits leave the nest when they are rather small, and I’ve seen ones smaller than this navigating their way through the yard in search of new lands to conquer. I guess once they are a certain size all there is left to do is find a nice quiet spot, stay away from predators, and eat as many leaves as you can in order to grow larger. This cottontail was only about 15cm (6 inches) long though the adults around here tend to be around 44cm (17 inches) long. I’ve never had them eat anything I am growing in the garden (that I know of), but there are also plenty other plants around to much on in the all you can eat dandelion buffet. I shot a number of photographs together in a sequence which nicely formed a very short timelapse of the consumption of a dandelion leaf which you can view below (on Vimeo). For more wildlife photographs visit my Animals and Wildlife Gallery in the Image Library. 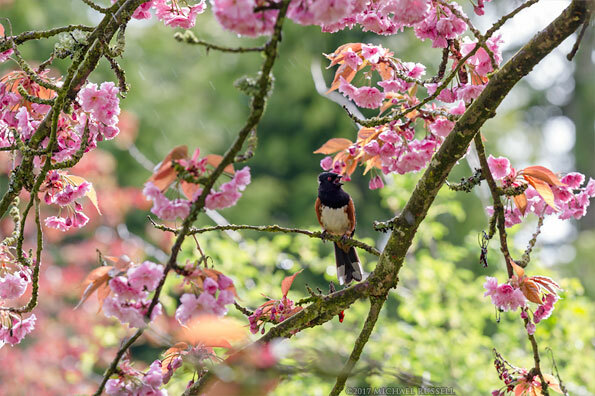 A male Spotted Towhee (Pipilo maculatus) singing in a flowering Kanzan (or Kwanzan) Cherry tree during a spring day. 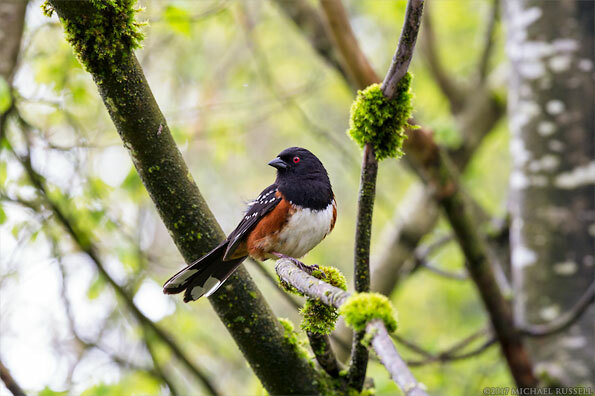 One of the more elusive bird species found in my backyard is the Spotted Towhee (Pipilo maculatus). They are easy to find, and are around frequently, but are also rather shy and tend to forage on the ground, scratching beneath shrubs, trees, and vines. It seems that they are easier to photograph in the spring – perhaps building nests and finding mates requires a bit more boldness than usual. Both of these male Spotted Towhees were fairly easy to photograph as they sat higher up in the trees than they would normally be found. The first photo here shows a male singing (in the rain) up in a flowering cherry tree in full bloom (Kanzan or Kwanzan variety). The second Towhee is a bit more cautious and seems to be feeling a bit vulnerable in a relatively open area of the forest. When I was learning about local birds many years ago this Spotted Towhee species was referred to as the “Rufous sided Towhee”. The Spotted Towhee and the similar Eastern Towhee were once considered the same species (and probably were, long ago), but now are known to be separate. One male Spotted Towhee in my neighborhood seems to love to stand on window ledges and jump up and attack his reflection. This results in noise that causes the dog to bark, and the smearing of bird poop all over the windows. He has since expanded this behaviour to my car’s side view mirrors with similar, messy results. It could be worse though, my neighbor reports that one attacks their bedroom window at dawn (likely the same bird). At least he is letting me sleep! For more of my bird photographs visit my Bird Photos Gallery. 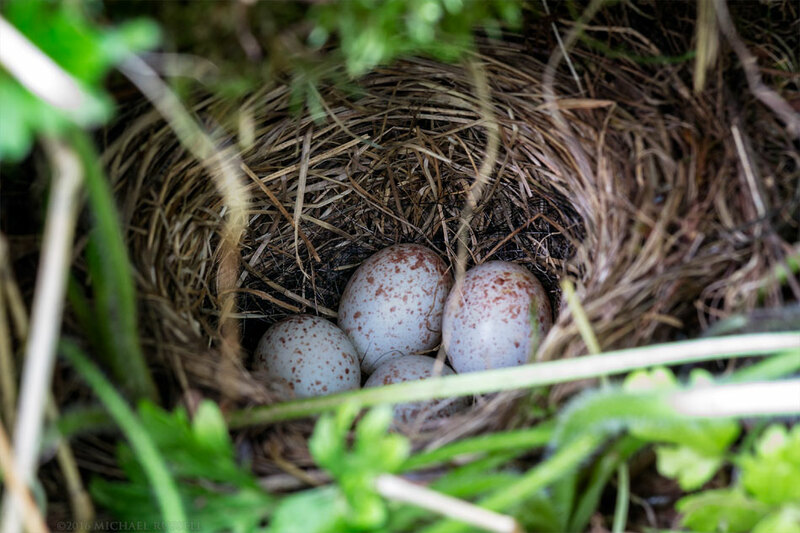 In late April I was mowing the grass growing between the raised vegetable garden beds and discovered this Dark-eyed Junco nest, complete with eggs, on the ground underneath a small overhang. This is a common place for Juncos to place their nests, I’ve come across a few others on the ground in tall grass in previous years. I try not to disturb these junco nests when mowing, but I did flush out the female that was sitting on the it at the time. She did sit on the nest again about 5 minutes later, however. A week later I did take a look at the nest (from afar, at first) and the eggs were gone. We have a lot of Black Squirrels (invasive species) that love to snack on bird eggs, so that might have been the fate of this particular clutch. Crows are another likely candidate, though they are not the only other bird species that would look at these as lunch. For more photographs of birds visit my Bird Photos Gallery.